What is innovation? How do we define innovation, its outputs and processes, and what are the skills and competencies necessary to practice and excel in innovation? Interested in all the details? Hit the button to download the full paper. Otherwise, browse below! Many strategies and policies, both federal and provincial, have attempted to improve Canada's innovation capacity in the last few decades. Universities and colleges are often discussed in these strategies for their role in facilitating new partnerships and in developing (potentially) actionable research. It is rare, however, for these strategies to recognize education plays in the creation of innovators. This is counterintuitive: education is an obvious mechanism with which to develop the knowledge and abilities of a population. Yet we lack a holistic understanding of what it takes to practice innovation, let alone the kinds of curricula that might provide those skills and competencies. Moreover, we are inconsistent in the definitions and language we use to define innovation–often obsessing over technology and commercialization. We tend to assume innovation comes from research and development processes, and that innovators are simply highly skilled people. Presented here is the result of an intensive review of reports, strategies, policy, and theory on innovation in the Canadian context. This literature was scanned and coded–inspired by the ethnographic methods of grounded field theory–in order to synthesize a holistic theory of innovation. 13 learning domains, 47 learning constructs, and 227 learning outcomes comprise a holistic model of innovation education. Use the interactive map below to explore the model yourself! This theory includes a universal definition of the innovation process, a recasting of different focuses of innovation as innovation orientations, a comprehensive model of the innovation process, and a synthesis of innovation skills and competencies into 13 learning domains, 47 learning constructs, and 227 learning outcomes. These tools provide utility for policymakers and educators in pursuit of understanding and improving innovation capacity. In particular, the model of innovation education is the most comprehensive of its kind, providing an extensive set of concepts with which to understand education gaps and build curricula. Perhaps the most important contribution of this research, however, is the recognition that our conversations about innovation strategies and education reform must be aligned. How exactly do people learn to be innovative, and how are our education systems currently facilitating that process? With this study we have begun to seek answers to these questions, but there is much more work to do. If you use these ideas and learn something from your experience, or if you have thoughts on how to improve them, don't hesitate to make suggestions and to share your work. 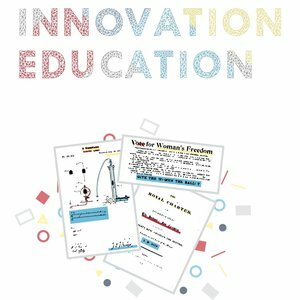 Find resources on this page that detail the definitions and models of innovation developed through this research and how these concepts may be applied in innovation education programming. Across dozens of perspectives on innovation, a set of 13 domains of skills and competencies emerged. These domains have been interactively visualized using Kumu.io. You can play with the work yourself by clicking the button. Use the controls in the bottom corners to focus on specific components of the model, to surface the innovation process so that you can explore both simultaneously, and more. Note that the visualization is best explored on a desktop! This document provides an executive summary of the insights and models on innovation education uncovered through this research and guides educators to put these concepts and tools to use. Education reform presents an opportunity to improve innovation education and, in turn, advance innovation capacity. I synthesize the framing and strategy of resources from provincial, national, international, and theoretical perspectives on innovation in order to develop a holistic model of innovation and a curricula for innovation education. Then, I use systemic design to model Newfoundland and Labrador’s current education system and to suggest strategies for reform to enable improvement in Newfoundland and Labrador’s innovation education. Finally, I explore how systemic reform in Newfoundland and Labrador may serve as a systems laboratory for reform efforts in other jurisdictions. Innovation Education is a major research project presented to OCAD University in partial fulfillment of the requirements for the degree of Master of Design in Strategic Foresight & Innovation. This work was supported by the Social Sciences and Humanities Research Council of Canada. Thanks for your message! We'll be in touch.